Keywords: Double-barrel postgraduate training model; sustainable obstetrics and gynecological specialist; training the future trainer; West African subregion. Who is an obstetrician and gynecologist? An obstetrician and gynecologist is a physician specialist who provides medical and surgical care to women and has particular expertise in pregnancy, childbirth, and disorders of the reproductive system. This includes preventive care, prenatal, antenatal and postnatal care, perinatal care, family planning, management of sexually transmitted infections, and a wide range of diseases and disorders related to reproductive health. In the United States, the obstetrician/gynecologist is commonly abbreviated as Ob/Gyn specialist and can serve as a primary physician or as a consultant to other physicians. They can have private practices, work in hospital or clinic settings, maintain teaching positions at university teaching hospitals, and also work as administrators in public health and preventive medicine facilities. The obstetrician and gynecologist can also work as reproductive health consultants/directors to national, international, and supranational agencies and foundations, such as World Health Organization, United Nation Population Fund, United Nation Children's Fund, Ford Foundation, and Bill and Melinda Gate Foundation. Obstetrics and gynecological practice is usually generalist or broad-based, although many Ob/Gyn practitioners focus on unique areas to provide high-quality health care to women. Acute and chronic medical conditions, adolescent gynecology, behavioural problems, cancer, endocrinology, health maintenance during pregnancy, infertility, operative gynecology, pregnancy and delivery, preventive health, and urinary tract disorders. The past two decades have witnessed an evolution in the pattern of training of resident doctors in obstetrics and gynecology, the world over, with changes introduced in various aspect of the training of Ob/Gyn resident doctor. These changes are attributable to various factors including changes in patient populations, increased malpractice liabilities for obstetricians, the risky nature of certain procedures, and new evidence-based practices. The goal of an obstetrics and gynaecology residency program is to achieve and maintain excellence in the education and training of obstetricians and gynaecologists. This ensures that the program adequately prepares the next generation of obstetrician-gynaecologists to become competent and confident specialists with an interest in lifelong learning, leadership skills, and the ability to adapt to the needs of their health care system. The strength of the new residency model is believed to lie in having a structured, competency based, closely supervised approach to training, with standardized evaluations, timely feedback, and a committed faculty. In spite of the new changing patterns introduced in the residency training of most countries, it is generally believed that at the conclusion of an Ob/Gyn residency, the resident is expected to have a broad knowledge of generalist topics, which may however be usually associated with only a cursory knowledge of the subspecialties of family planning, reproductive endocrinology and infertility, gynecologic oncology, uro-gynecology, and MFM. The Singapore model may perhaps been patterned to overcome this scenario. Obstetrics and gynecological specialist training which commenced in Nigeria with the establishment of the National Post Graduate Medical College (NPMC) in 1960 and the West African Post Graduate Medical College in 1973 has witnessed little or no change whatsoever in the training curriculum and pattern, although some modifications have taken place with respect to the pattern of assessment and examination of the residents. The West African subregion harbors a group of countries characterized by poverty with its attendant associated malady of ignorance and disease. High maternal mortality and overall poor reproductive healthcare still ravage the subregion to the extent that it still remains to be ascertained to what extent the present pattern of obstetrics and gynecological residency training program meets with the production of Ob/Gyn specialist that will meet up with tackling the obstetrics and gynecological care needs of the people. Poor funding and overall poor health systems and health service infrastructure have dragged obstetrics and gynecological care in and indeed all healthcare services to the people to its lowest ebb. The poor die in their numbers while the rich exit to the developed countries to seek specialized obstetrics and gynecological care. This presentation evaluates the evolution of residency training in some developed countries and Nigeria; highlights Obs/Gyn postgraduate medical education in the United Kingdom, the United States, West Africa, and Nigeria; examines the challenges associated with the residency training in Nigeria and West African subregion; and recommends a dual training model that is expected to produce sustainable obstetrics and gynecological specialist with requisite motivation and expertise to provide specialized health care to people of the subregion and ensure the development of the expert Ob/Gyn specialist of the future. In a valedictory address delivered by Sir William Osler to graduating medical student of McGill University, in 1905, the eminent physician stated that the medical program was a life course, thereby insinuating that medical training was a continuum, spanning beyond first graduation. This perhaps represented the first hint toward the establishment of formal postgraduate medical education in the United Kingdom. Osler later became Chairman of the Postgraduate Medical Association in the United Kingdom, an organization set up in 1911 to develop postgraduate medical training in the United Kingdom. Its activities were, however, curtailed by the First World War. In 1921, the Athlon Committee was set up by the then British Minister of Health Dr. Addison, chaired by the Hon. Earl of Athlon, who was also the then chairman of the Middlesex hospital, and ultimately recommended the commencement of Post Graduate Medical School in the United Kingdom using a set of criteria. This resulted in the establishment in 1929, of the London School of Hygiene and Tropical Medicine, and in 1935, of the Postgraduate Medical School in Hammersmith, West London., Over the years, several instruments and legislations came into being essentially to harmonize the activities of the three main forces that propelled postgraduate medical education and specialist care in the United Kingdom – the Royal Post Graduate Medical Colleges, the Post Graduate Medical Universities and Institutes, and the National Health Service. Notable among these instruments and legislations are the 1945 British Post Graduate Medical Federation, set up by the University of London that brought together the Postgraduate Medical School at Hammersmith Hospital and the 13 institutes that were domicile in the existing Specialist Hospitals in London; the act establishing the 1-year preregistration internship in 1950; the Christchurch Conference (Oxford) convened by the Nuffield Provincial Hospital Trust in 1961 which established the principle that all doctors should have postgraduate education at the same time as occupying posts in hospital, thereby stimulating the setting up of Postgraduate Centres in District General Hospitals; the Health Services and Public Health Act of 1968 which set up, under Section 63, the provision of funds for the continuing education of general practitioner and the National Health Service (Vocational Training) Act of 1976 which laid down a program of 2 years' hospital experience in an assortment of specialty posts, followed by a year of traineeship in general practice, as the essential requirement for a newly appointed Principal in general practice. Memberships and fellowships were awarded to postgraduate medical trainees who have acquired the requisite clinical competences in the relevant specialties while the universities awarded relevant degrees on the basis of academic research and creative output. Other similar polyclinic post basic medical trianing institutions emerged, notably in the states of New York and Philadelphia and eventually spreading to most other states of United States and Canada, and represented groups of informal postgraduate training schools. These schools were unstructured, uncoordinated, individual-centered, and often profit-oriented, offering trainings on varying short-course bases. Flexner's recommendation resulted in the closure of several substandard medical training schools and the restructuring and standardization of the remaining ones to reflect the flexnarian good practice recommendation. The first formal residency training program in the United States was established by Dr. William Halsted along with his other friends – William Osler, William Welch, and Howard Kelly, who together founded John Hopkins Hospital Baltimore Maryland in 1892, where he became the first professor of surgery. Residency training in the various specialties had thereafter become better structured and more coordinated, in the United States and Canada. Some other countries of the subregion have also established their national postgraduate medical college, for example, The Ghana National Post Graduate Medical College which was established in 2003. Specialty training in obstetrics and gynecology in the United Kingdom has a minimum duration of 7 years. There are three components to the program – basic, intermediate, and advanced training [Figure 1], which following successful completion will lead to the award of a Certificate of Completion of Training (CCT) or a Certificate of Eligibility for Specialist Registration (CESR). The programs are determined, in context and structure, by the Royal College of Obstetricians and Gynecologists and approved by the Postgraduate Medical Education and Training Board. Trainings involve the acquisition of competencies appropriately documented in manual logbook which is commenced at the start ST1 Year (basic training level). A defined level of attainment of competences is required for the trainee to progress from this basic level to intermediate (ST2–ST3) training level and further from intermediate to advanced (ST5–ST6) training level. For the CCT/CESR to be awarded to the trainee, the logbook should be successfully completed following appropriate signatures by the clinical trainers. Training also requires that the trainee undertakes courses stipulated in the training program commencing with Basic Surgical Skill Course which is mandatory and must be undertaken by the completion of year 2. The MRCOG exam is internationally acclaimed to be the gold standard qualification in career progression in O and G. It was first held in 1931 for those wishing to specialize in obstetrics and gynecology. There are three-part assessment to the exam:- Part 1 MRCOG: which is a written examination to evaluate basic and clinical sciences relevant to the subject; Part 2 MRCOG which is a written examination that assesses the application of knowledge; and Part 3 MRCOG which is a stand-alone clinical skills examination which assesses the ability of the candidate to apply core clinical skills in the context of the skills, as defined in the Part 2 MRCOG curriculum [Figure 1]. Part 3 MRCOG is part of the assessment and validation process for entry on to the UK Specialist Register and progress to a consultant post in O&G. 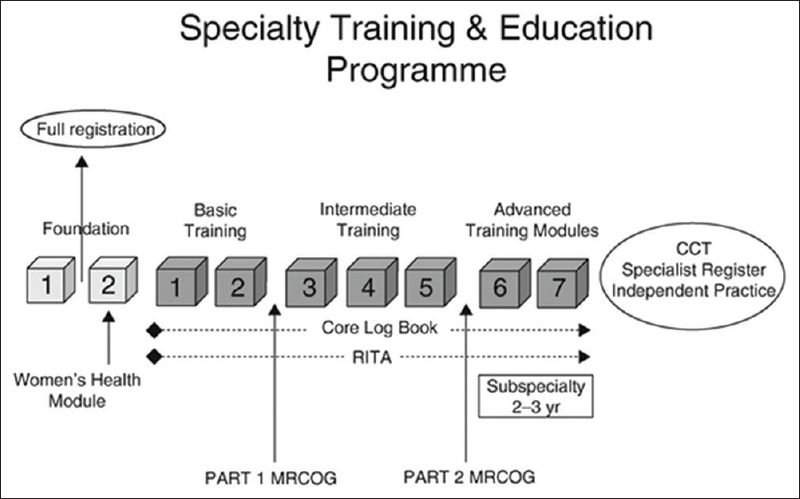 Part 2 and Part 3 MRCOG Exam must be passed by UK specialty trainees to qualify to progress from ST5 to ST6. The West African Postgraduate Medical College was established in 1976 following the harmonization of the Association of Surgeon of West Africa started in 1960 and Association of Physician of West Africa started in 1963, both of which became transformed under the West Africa postgraduate medical college, into West Africa College of Surgeon and West Africa College of Physician. Both colleges commenced postgraduate medical education in 1979. Promote excellence in professional training. Supervised by Fellows in the area of practice. Fellowship certificate to trainees who should be able to take up substantive or honorary university clinical lectureship position on successful completion of the program; to take up substantive or honorary consultant obstetrician and gynecologist post on successful completion of the program; and able to provide professional leadership in reproductive health care at tertiary centers and other settings. The applicant should be a fully registered medical practitioner. Admission into the training program requires that the candidate should possess a qualification registrable by the constituent country medical council and has obtained full registration to practice in the country. In addition to this, the applying trainee should have satisfied the Admission Panel of the training institution that he or she has applied to undertake the program of study. Some training centers may insist that the applicant should have passed the primary examinations of the college or its equivalent, to be eligible for offer of training decision. The enrolled postgraduate trainee shall be known as resident doctor. Training institution duly accredited for the training program abound in the constituent countries of the college. Four main domains constitute the criteria for the accreditation of a training center – personnel, infrastructure and services available, structured training program, and acquisition of site (s) for community/rural obstetric posting for the trainees. The minimum duration shall be 3 years, full-time, for the award of Membership and an additional 2 years for the award of the Fellowship of the College. The award of membership certificate requires that the candidate shall have passed through exams – the Primary Examination and Part I (Membership) examination, while the award of fellowship certificate requires that the trainee shall pass Part II Final (Fellowship) examination. This is taken at any time after full registration as a medical practitioner. The examination is on the basic sciences as applied to obstetrics and gynecology and other relevant aspects of reproductive health and covers areas specified in the syllabus. The supervising consultants are expected to certify the successful and satisfactory completion of the stipulated training period. The trainee is also expected to submit along with the application for the examination a duly completed and appropriately certified logbook containing the activities performed by him or her during the course of the training. The eligibility criteria to undertake Part I examination also includes the acquisition of surgical skills from accredited surgical skills training centers and evidence of attendance of at least one revision course. A candidate who is successful at Part I examination is awarded a Membership of certificate of West Africa College of Surgeon. A minimum of 24 months following the passing of Part I examination is required for eligibility to sit for Part II final fellowship examination. The candidate is expected to have completed and submitted a casebook and dissertation on an approved topic of research on any aspect of obstetrics, gynecology, or reproductive health before being invited into the examination. Attendance at a college-organized manuscript writing course is also mandatory before taking the examination. The Fellowship certificate of the West African College of Surgeons shall be recommended to the Council to be awarded to a candidate who has passed Part II Examination [Table 1]. The NPMC is an offshoot of the Nigeria Medical Council (NMC) which was established in 1963. By decree 44 of 1969, approval was given for the establishment of examination boards in various medical specialties by the NMC. The program involved examinations at three levels – primary, Part I, and Part II final examination leading to the award of Fellowship of the Medical College in Obstetrics and Gynaecology (FMCOG). First primary was in May 1972 and involved 29 candidates, out of which 15 were successful. The first Part I examination in Internal Medicine was in November 1973. One out of 5 candidates who appeared for the examination passed. The NPMC took over from the NMC by a decree in September 1979 establishing it and providing for 13 faculties, a College Senate, and a Governing Board. The College was formerly inaugurated in February 19, 1984, by President Shehu Shagari., The National Postgraduate Medical training in Obstetrics and Gynaecology has a similar pattern to that of West African College of Surgeons, consisting of primary, Part I, and Part II final examination. Eligibility to sit for the primary examination requires that medical practitioner will have full registration with medical and dental council of Nigeria. College recognizes training commenced after passing Primary examination, and registration as an associate fellow of the college. Faculty duration of training for obstetrics and gynecology is as follows – Junior Residency (leading to Part I fellowship examination) minimum of 30 months and Senior Residency (leading to Part II fellowship examination) minimum of 24 months. Eligibility for Part I examination involves 2 years core training in obstetrics and gynecology and 6 months rotation in other relevant specialties. The trainee shall also present a casebook and would have successfully completed the logbook with appropriate certification by the supervising consultants. Eligibility for Part II final examination requires candidates would have completed a dissertation on an approved topic of research on any aspect of obstetrics, gynecology, or reproductive health. On completion of training, the trainee is awarded Fellowship of the Medical College in the Obstetrics and Gynecology (FMCOG). MD-PhD program represents a pathway to postgraduate medical training. It provides training in both medicine and research. It is specifically designed for those who want to become research physicians, also known as physician-investigators or physician-scientists, and organizes the experimental and clinical thinking of the physician-scientist, asynergy that enables a physician-scientist to recognize new ways that clinical care or the understanding of disease mechanisms will benefit from research. The synergy achieved in dual-degree training enables the physician-scientist to see how the results of research discoveries and insights can be converted into clinically significant outcomes. The typical track of the MD/PhD program is often termed the “2-3-2” or “2-4-2” track, reflecting the number of years that a student participates in each of the three sections of MD-PhD training. In a typical program, trainees undertake basic medical science courses (2 years), an intense period of PhD research, and completion of the thesis (3–4 years) and clinical residencies (2 years). Variation to this typical training pattern may occur. For example, some programs offer significant integration between the PhD program and medical school courses in years 1 and 2. Residency and fellowship trainings follow the dual degree program lasting 3–7 years as in MD program. As faculty member at academic medical centers, an MD-PhD physician-scientist spends 70%–80% of his or her time conducting research, though this can vary with specialty. This research may be lab-based, translational, or clinical. The remaining 30% of his time is usually divided between clinical service, teaching, and administrative activities. Graduates of MD/PhD complete their programs in an average of 8 years and most continue their postgraduate training in top hospitals in the country. Poor health systems and health services infrastructure has its toll on the poor and the rich in the society alike. The triad of poverty, ignorance, and high disease burden encumbered by inadequate health services may have contributed to the acceleration of the death of several poor people; undoubtedly however, poor health services, by driving the rich to exit and seek for more quality healthcare abroad, has contributed immensely toward the depletion of financial and economic resources of these developing countries. It has been reported that every year, Nigerians spend $1 billion on medical treatment abroad – notably India, South Africa, the United Kingdom, and the United States. The attraction to the patronage of these countries is related to the availability of highly sophisticated technology and expertise, and in the case of India the relatively low cost of obtaining quality health care. The obstetrics and gynecology remains a foremost specialty expected to play a leading role in the containment of maternal and neo-natal mortality burden in Nigeria and similar developing countries. Over the past four decades, several Ob/Gyn professionals have been churned out especially from the two medical colleges – West Africa College of Surgeon and the National Post Graduate Medical College – altogether lumbering almost 2000. This number undoubtedly represents but a drop of water in an ocean when seen in the light of the population of 180 million Nigerians that they are expected to serve. Nonetheless, the quality of care and by implication, the expected impact to be made by these obstetrics and gynecological specialist still needs to be objectively ascertained. Most of these obstetrics and gynecological specialists are generalist-based in their training and are therefore expected to practice only but general obstetrics and gynecology which can at the best be shallow and bereft of the in-depthness associated with the subspecialist component of the specialty, the basic core of which are reproductive medicine and infertility, maternal and fetal medicine, uro-gynecology, and gynecological oncology. The dual (double-barrel) training model requires that as a trainee resident doctor (who will have passed his or her primary examination in obstetric and gynecology) commences residency training in an accredited health facility, he or she simultaneously enrols for the master's degree programs in his/her subspecialty of choice in a university duly accredited to run the subspecialty degree. This implies that the requirement for enrolment into the university postgraduate subspecialty program is an admission to commence the residency training program in college-accredited health facilities. The expectation is that by the third year when the resident doctor will be sitting for his Part I fellowship examination, he or she will have qualified to complete the master's degree program in the subspecialty. By the fifth or sixth year, when the resident trainee is sitting for his Part II final examination, he or she would also be completing the PhD postgraduate degree of the subspecialty. In 2011, the National University Commission (NUC) developed a Benchmark for the Minimum Academic Standards (BMAS) for 13 postgraduate disciplines in Nigeria's university education system. The 13 volumes document represented each of the 13 disciplines of the Nigerian university system which includes Law, Engineering and Technology, Pharmacy, Social Sciences, Art, Medicine, Sciences, Administration, Agricultural Sciences, Veterinary Medicine, Basic Medical and Health Sciences, Environmental Sciences, and Education. While receiving the documents from the Executive Secretary of NUC, the then Minister of Education, Professor Rukkayar Rufai, stressed that apart from giving direction for postgraduate education in Nigeria, the postgraduate BMAS would be useful as reference document for the accreditation of postgraduate programs even as it would ensure that universities follow due process in the establishment of their postgraduate programs through appropriate NUC Resource Verification Exercise and subsequent approval. Providing opportunities for even more experts to be trained in these subspecialties thereby providing a critical mass of expert human resources that can be distributed to health facilities throughout the nation to serve the people. To a considerable extent, these steps have been brought to bear in the development of the dual postgraduate training model in obstetrics and gynecology. Steps 1–4 had been vividly captured, while steps 5 and 6 await the approval and adoption of training model. It is envisaged that this new postgraduate training model, if adopted and implemented, especially backed with the provision of appropriately congenial health system and health services infrastructure, together with appropriate funding and healthcare partnerships, would go a long way toward revolutionizing obstetric and gynecological practice in the West Africa subregion turning out sustainable obstetrics and gynecological super specialists that will meet the needs of all segments of the population – the rich and the poor alike. Health Communities. com partners. What is an Ob/Gyn? Cornell University, Department of Urology, Sexual Medicine Society of North America. Published: 2001 Jun 09; Last modifed: 2015 Oct 01. Vesico V, Lau S, Mallozzi A, Reinblatt S. Subspecialty Residency Program; department of Obstetrics and Gynaecology, McGill University Health Centre, Royal Victoria Hospital, Glensile; www.mcgil.ca; Availabe from: https://www.mcgill.ca/obgyn/education/postgraduate-medical-education/subspecialty-residency-programs. [Last accessed on 2017 Oct 05]. Royal College of Obstetrics and Gynecologist subspecialty training. www.rcog.org.uk; 2017. American College of Surgeons Obstetrics and Gynaecology. www.facs.org; 1996–2017. Grupta M, Dragovic K, Trester R, Blankstein J. Changing scenario of obstetrics and gynaecology residency training. J Grad Med Educ 2015;7:401-6. Mazoh E, Vichyarthi A, Wachter R, Anerbach A, Katz P. Impact of duty hour restriction on resident inpatient teaching. J Hosp Med 2009;4:476-80. Coonar A, Dooley M, Daniel M, Taylor R. The use of role play in teaching medical student obstetrics and gynecology. Med Teach 1991;13:49-53. Yong OM, Parviainen K. Training Obstetrics and Gynaecology resident to be effective communicators in the era of the 80-hour workweek: A pilot study. BMC Res Notes 2014;7:455. Kane SM, Siddiqui NY, Bailit J, Blanchard MH. Duty hour restrictions, ambulatory experience, and surgical procedural volume in obstetrics and gynecology. J Grad Med Educ 2010;2:530-5. Short AC, Rogers SJ, Magann EF, Rieg TS, Shapiro A, Morrison JC. The 80-hour workweek restriction: How are OB/GYN resident procedure numbers affected? J Matern Fetal Neonatal Med 2006;19:801-6. Bruce PJ, Helmer SD, Osland JS, Ammar AD. Operative volume in the new era: A comparison of resident operative volume before and after implementation of 80-hour work week restrictions. J Surg Educ 2010;67:412-6. Nielsen PE, Munroe M, Foglia L, Piecek RI, Backman MP, Cypher R, et al. Collaborative practice model: Madigan Army Medical Center. Obstet Gynecol Clin North Am 2012;39:399-410. Stevens JR, Witmer TL, Grant RL, Cammarano DJ 3rd. Description of a successful collaborative birth center practice among midwives and an obstetrician. Obstet Gynecol Clin North Am 2012;39:347-57. Bowen J. Adapting residency training: Training adaptable residents. West J Med 1998;168;371-7. Shephali T, Bernard C, Shen Li, Lay K, Kok H. Specialist training in obstetrics and gynaecology in Singapore: Transition to structured residency program. J Grad Med Educ 2012;4:272-5. Accreditation Council for Graduate Medical Education International. Advanced Specialty Program Requirements for Graduate Medical Education in Obstetrics and Gynecology. Available from: http://www.acgmei.org/web/requirements/specialtyprs/obstetricsgynecology.pdf. [Last accessed on 2012 Apr 21]. Osler W. The student life. Valedictory address to students at McGill University, April 1905. In: Selected Writings of Sir Osler. Oxford: Oxford University Press; 1951. Postgraduate Medical Committee. Report of the Postgraduate Medical Committee. London: HM Stationery Officer; 1921. p. 29. Cook GC. John MacAlister's Other Vision. A History of the Fellowship of Postgraduate Medicine. Oxons, UK: Radcliffe; 2005. Inness WD. The evolution of postgraduate medical education. Postgrad Med J 1985;61:871-3. Flexner A. Medical education in the United States and Canada. From the Carnegie Foundation for the Advancement of Teaching; Bulletin Number Four, 1910. Bull World Health Organ 2002;80:594-602. Wyet A; quotation cited in: Flexner A. Report on Medical education in the United States and Canada. Chapter XII; p. 174-177. Available from: http://archive.carnegiefoundation.org/publications/medical-education-united-states-and-canada-bulletin-number-four-flexner-report-0. [Last accessed on 2017 Oct 10]. Imbar G. Genius on the Edge: Bizarre Double Life of Dr. William Stewart Halsted. New York: Kaplan Publishing; 2010. p. 138-43. Ofosu AS. National Postgraduate Medical College. History of Ghana Postgraduate Medical College. www.gcps.edu.gh/?pgid3279; 2011. RCOG (UK). Core curriculum element: Specialty training and education. Available from: http://www.gmc.uk.org/corecurriculumelement. [Last accessed on 2007 Feb 1]. RCOG (UK) MRCOG: A global exam; 2017. Available from: http://www.rcog.org.uk/en/careers training/mrcogexams. [Last accessed on 2017 Oct 08]. Onwudiegwu U. Current trends in medical education in Nigeria. Niger J Health Sci 2010;10:5-13. Faculty of Ob/Gyn, West African College of Surgeons. Training curriculum for the membership and fellowship in Ob/Gyn; February 2014. Available from: http://www.wacscoac.org. [Last accessed on 2017 Oct 10]. Whitten SM, Blott MJ. Objective Structured Assessment of Technical Skills (OSATS) in obstetrics. In: Warren R, Arulkumaran S, (eds). Best Practice in Labour and Delivery. Cambridge: Cambridge University Press; 2009;341-8. Danmole HP, Adeniji A. A History of National Postgraduate Medical College of Nigeria, 1979–2009. 1st ed. Ijanikin, Lagos: NPMC; 2011. ISBN 978-2283-39-8. National Postgraduate Medical College of Nigeria. Criteria for qualifying candidates for Fellowship exam; 2017. Available from: http://www.npmcn.edu.ng. [Last accessed on 2017 Oct 10]. Trend in maternal mortality: 1990-2013 – Estimates by WHO, UNICEF, UNFPA, the World Bank and the United Nations population division; 2013. p. 4, 36. Nigeria Demographic and Health Survey 2013 preliminary report; Population Commission Abuja Nigeria, Measure DHS, ICF International, Calverton, Maryland, USA; October 2013 (USAID, UKAID, UNFPA, NPC). p. 20. Harrison KA. Maternal morbidity in Nigeria: The real issues. African J Rep Health 1997;1:7-13. Adinma JIB, Adinma ED. A critic of MMR reduction efforts in Nigeria. Trop J Obstet Gynaecol 2011;28:5-13. Adinma JIB, Adinma ED. Profile of maternal mortality and maternal health services in Nigeria. J Biomed Investig 2015;49. Every year, Nigerian's spend $1bn on medical treatment abroad. Available from: https://www.thecable.ng/every-year-nigerians-spend-1bn-medical-treatment-abroad. [Last accessed on 2017 Oct 13]. Economic Confidential. National New Bench for Postgraduate Programmes in Nigeria. Available from: https://economicconfidential.com/news/national-news/new-benchmarks-for-postgraduate-programmes-in-nigeria/. [Last accessed on 2011 Dec 15]. NUC develop Minimum Standard for 13 postgraduate disciplines. Available from: http://www.nigerianbestforum.com/index.php?topic=145945.0. [Last accessed on 2011 Dec 06]. Kern DE Thomas PA, Howard DM, Bass EB, editors. Curriculum Development for Medical Education: A Six-Step Approach. Baltimore and London: The Johns Hopkins University Press; 1998. Double-barrel postgraduate training model; sustainable obstetrics and gynecological specialist; training the future trainer; West African subregion.